Foreword by Bill Gates LinkedIn cofounder, legendary investor, and host of the award-winning Masters of Scale podcast reveals the secret to starting and scaling massively valuable companies. What entrepreneur or founder doesn't aspire to build the next Amazon, Facebook, or Airbnb? Yet those who actually manage to do so are exceedingly rare. So what separates the startups that get disrupted and disappear from the ones who grow to become global giants? The secret is blitzscaling: a set of techniques for scaling up at a dizzying pace that blows competitors out of the water. 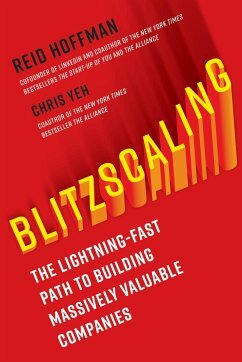 The objective of Blitzscaling is not to go from zero to one, but from one to one billion -as quickly as possible. When growing at a breakneck pace, getting to next level requires very different strategies from those that got you to where you are today. In a book inspired by their popular class at Stanford Business School, Hoffman and Yeh reveal how to navigate the necessary shifts and weather the unique challenges that arise at each stage of a company's life cycle, such as: how to design business models for igniting and sustaining relentless growth; strategies for hiring and managing; how the role of the founder and company culture must evolve as the business matures, and more. 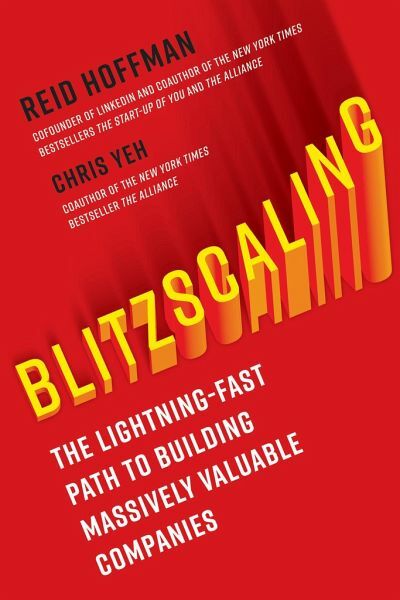 Whether your business has ten employees or ten thousand, Blitzscaling is the essential playbook for winning in a world where speed is the only competitive advantage that matters. REID HOFFMAN is an entrepreneur and investor. In 1998, Reid Hoffman was a founding Board member and executive vice president of PayPal. In 2003, he co-founded LinkedIn, the world's largest professional networking service. He was an angel investor in Facebook and Zynga, and in 2009, he became a partner at the venture capital firm Greylock Partners. He currently serves on the boards of Airbnb, Apollo Fusion, Aurora, Coda, Convoy, Entrepreneur First, Gixo, Microsoft, Nauto, and Xapo, as well as not-for-profits Kiva, Endeavor, CZI Biohub and Do Something. He hosts Masters of Scale, an original podcast series. He is also the co-author of two New York Times best-selling books: The Start-Up of You and The Alliance. He is an Aspen Institute Crown Fellow, a Marshall Scholar at Oxford, and a graduate of Stanford University. CHRIS YEH is an entrepreneur, writer, and mentor. He holds two degrees from Stanford University and an MBA from Harvard Business School, where he was a Baker Scholar. He is co-author of the New York Times bestseller The Alliance with Reid Hoffman and Ben Casnocha.